When Nelson Mandela passed away in 2013, British politicians were queueing up to pay tribute. However, it should not be forgotten that the British police went to enormous lengths to infiltrate and disrupt the campaign in this country to help sweep away apartheid. Margaret Thatcher denounced the African National Congress as a typical terrorist organisation. Previously confidential official files released under the Freedom of Information Act show how Special Branch penetrated the Anti-Apartheid Movement from top to bottom over 25 years – at least from 1969 to 1995. The files presented here come from two different sources. One set was unearthed in 2005 by BBC journalist Martin Rosenbaum, who kindly agreed to share them with the Special Branch Files Project. An additional batch covering 1969-1970 are Special Branch files from the National Archive, photographed by The Guardian journalist Rob Evans. The collection includes files on the policing of the Stop The Seventy Tour (STST) and the protection of the Springboks, the South African Rugby team, touring the UK. The material Rosenbaum saw suggests that Special Branch had around 30 inch-thick files cataloging its surveillance of the anti-apartheid movement. They contain a mixture of public documents such as leaflets and newspaper cuttings and private information, such as secret reports of demonstrations and meetings. It seems that any demonstration, no matter how small, such as a picket at a local supermarket, was spied upon and registered in the files of Special Branch. In a similarly thorough way, the reports contain minutes of meetings from local branches in the suburbs to invitation-only gatherings where protests were planned and the strategy of the Movement was discussed at the highest level. From the files, it is clear that Special Branch had people on the inside at many levels of the movement. The documents contain frequent references to information received from ‘secret and reliable’ sources. Because Special Branch is pretty serious about protecting their sources, it is difficult to say whether the information comes from informants, activists who have been recruited by the police to pass on information, or from infiltrators, police officers gone undercover, living the life of a dedicated activist. For instance, a ‘secret and reliable source’ supplied information about the monthly meeting of the Highgate branch of the Anti-Apartheid Movement in June 1982. Six campaigners were at the meeting which was held at the home of one of the activists. The source appears to have attended as he or she was in a position to report details of the meeting, such as the fact that it started at 7.30pm and ended at 10.20pm, frustrations about the lack of attention for a South African dispute and the organising of leafleting in local shopping streets the following weekend. ...and the decision to drastically cut the names on the mailing list. One message in 1981, notes that the public sector union NUPE had decided to picket the South African embassy. Special Branch decided not to pass this on to their colleagues in the Met’s Public Order Branch A8 because it ‘may well come from sensitive source’. ...it 'may well come from sensitive source'. Special Demonstration Squad, the SDS. The Anti-Apartheid Movement was amongst the first political groups to be penetrated by the Special Demonstration Squad, set up in 1968. The 2002 BBC documentary True Spies interviewed Special Branch officer Wilf Knight, the handler of Mike Ferguson, one of the unit’s first infiltrators. Wilf recalls how Mike targeted the ‘Stop the Tour’ campaign against the visit of the Springboks. There was huge opposition from radical groups to the planned visits of the rugby and cricket teams who were seen as ambassadors for Apartheid. Demonstrations were held, and there were plans to disrupt the tour. One of the motors behind the campaign was Peter Hain (MP for Neath until the 2015 elections and Foreign Office minister in 2002); Wilf claimed that Mike worked himself up to being Hain’s number two. Hain indeed features in a lot of the Special Branch Reports, however, information comes from many different sources as for instance this report about the run-up to the big match in Twickenham in 1970 shows. The reports were prepared by DI Gerry Donker, ‘an officer with comprehensive knowledge of South African politics, and were based on information supplied by a source close to the leadership of the Stop The Seventy Tour Committee, which was supplemented by Special Branch’s coverage of STST’s meetings and rallies and by surveillance.’ However, his reports reveal that Donker also made inquiries himself, for instance into Hain’s background, concluding that although he was the public face of the campaign the ‘real instigator’ was his ‘strong-willed’ mother. This report is signed by DI R Wilson, the same Ray Wilson who, with Ian Adams, published A History of Special Branch in 2015. The book mentions DI Donker, as quoted above, but Wilson does not make any reference to his own role in spying on the anti-apartheid movement. From his report it is clear though that Wilson collated the intelligence brought in by undercover officers and other informers, and that he kept a close eye on the activities of specific people and the developments of tiny splinter groups such as the the Britain Tricontinental Organisation – ‘a small Moscow/Cuba oriented group’. ... and less well known attenders were searched at the door. Special Branch regularly received reports of the movement’s members-only annual general meetings, at which the group’s political strategy for the coming year was discussed. The reports give details of those elected to the movement’s executive committee, sometimes noting whether individuals are linked to the South African or British Communist Parties, along with the makes and registration numbers of their cars. The files also include internal documents, such as this report from 1980 that notes the disappointment about the falling interest of its own members, the lack of co-operation between the various anti-apartheid and liberation movements and by the level of support it is getting from unions. ... no interest in their black 'brothers' thousands of miles away. While some spies seemed impressed by what they heard – with one report of a rally referring to ‘lucid examples of oppression against black minorities’ and ‘compelling’ arguments from ‘a barrage of quality public speakers’ – others clearly found their work rather tedious, as they had to sit through long speeches at boring meetings. The files contain reports of demonstrations that include names of speakers, what they said, how they were received by the audience and such like. The reports of demonstrations and pickets include methodical listings of the banners carried, leaflets distributed, slogans chanted, organisations represented, while known members of groups were identified and put on file. It is striking how it seems that no detail is too trivial to be stored. One report details how the Croydon branch of the Anti-Apartheid Movement held a meeting at 7.30pm on May 27 1982 at the White Horse Manor school in Thornton Heath. How many campaigners were at this meeting? Seven, it seems. and the meeting ‘ended without incident’. ...and reported that the posters probably belonged to local anti-apartheid campaigners. Special Branch noted at one point in the 1970s how a 17-year-old had formed a local group in the west London suburb of Ealing. Even the fact that a copy of the monthly members newsletter has been obtained by ‘a reliable source’ is worth documenting. 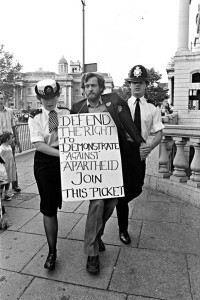 For many years the Anti-Apartheid Movement was one of the most active protest groups in Britain, until the end of white minority rule in South Africa in the early 1990s. The monitoring of the movement continued until the organisation was disbanded in 1995 following the end of apartheid and succeeded by a group called Action for Southern Africa (ACTSA). N.B. Hain was nominated for a life peerage in August 2015 and used the occasion to make a case for radical reform of the House of Lords. In December 2015, he received a top South African award for his years of anti apartheid activities. Also see: Anti Apartheid Movement – Files overview. Martin Rosenbaum, Tracking the anti-apartheid groups, BBC Freedom of Information Unit, 27 September 2005, (accessed November 2015). The Right to Know, broadcasted on BBC Radio 4 at 2000 BST on 27 September 2005. Rob Evans, Documents show how Special Branch infiltrated Anti-Apartheid Movement, The Guardian, 27 September 2005, (accessed November 2015). Rob Evans, British police spied on anti-apartheid campaigners for decades, The Guardian, 10 December 2013, (accessed November 2015). Solomon Hughes, Apartheid: Protests do work — just ask Thatcher. Government papers from 1984 show how rattled the South Africans and their British allies were over anti-apartheid activism, the Morning Star, 23 May 2014 (accessed December 2015) This article discusses papers released by the Home Office, as yet not in our collection. Special Branch dealt with the public order side of things and the demonstration that the AAM organised at the occasion, or so it seems from the files released to Martin Rosenbaum. See for instance this Special Branch Threat Assessment, 29 May 1984. Gavin Brown, PW Botha, police spies, and the South African Embassy Picket Campaign 1984, Non-Stop Against Apartheid, 30 May 2014, (accessed December 2015). Includes the photo below of Jeremy Corbyn arrested for defying the ban on demonstrating in front of the South African Embassy in London.